Teddy is so beautiful and photogenic! He must be a fabulous assistant! Agree, those are adorable! Teddy is a very lucky photog to have you to help him with his equipment this way. Love your sense of humor, too, BTW. Happy knitting! Those are great. Love Jean Greenhowe. 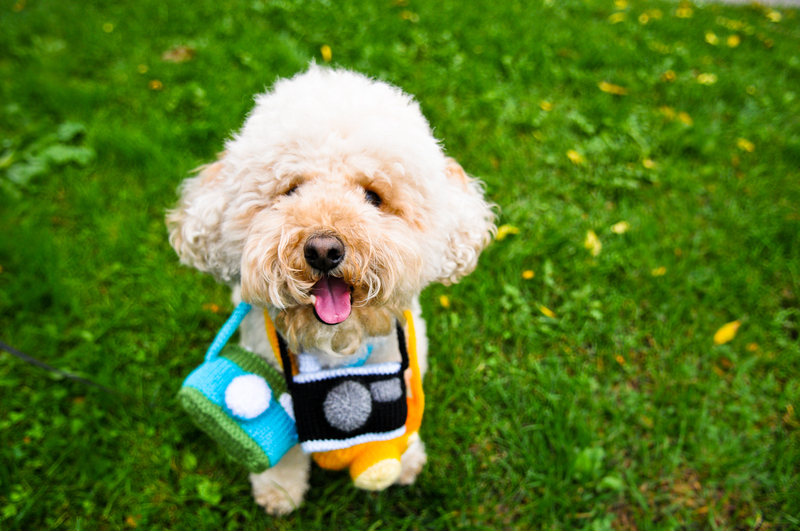 Teddy is the cutest little shutterdog I’ve ever seen! awwwwwww thank you for your comment! :) Teddie’s cuteness results in him getting what he wants 99% of the time! Aww what a lovely dog! I am also very fond of his cameras being an avid photographer myself! HAHAHAHHAhAHa that’s hilarious Lori!!! and it would make perfect sense if his name was Latte and that would be such a cuteeee name!!!! Ahhh sooo very cute!! I want a poodle so bad!!! What a cutie! Thank you again! :) Teddie is very talented indeed! My mom taught him to pick up all his toys and put them in the box! Hehehhe thank you!!!!! :) Do you own any pets yourself? Omg, Teddie is such a star. I really NEED one of these cameras, my daughter is a photographer and maybe if she had one of these cameras she could take the amazing pics that Teddie does. Teddie is SO adorable. And, I have NO bias about this at all since my family *doesn’t* happen to have a toy poodle around the same age xD lol Only difference is our toy poodle is black and his name is Benji! 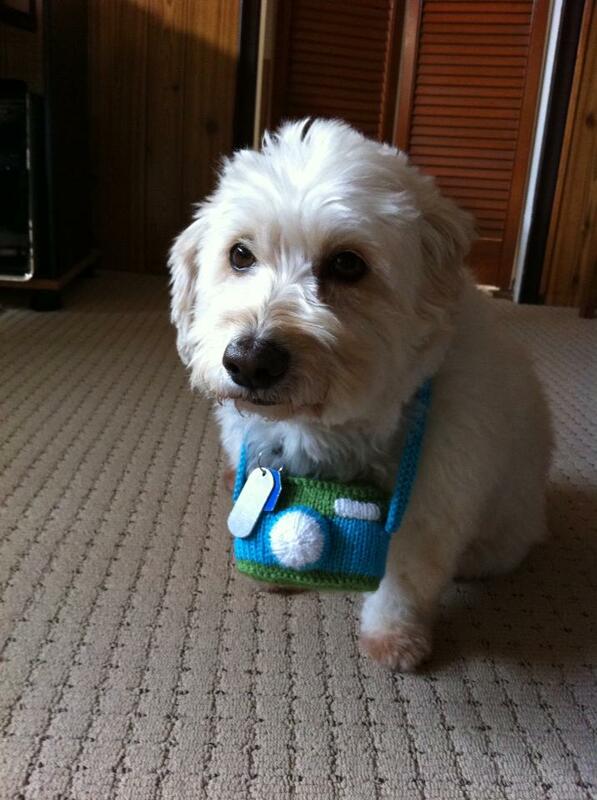 I wonder if I “get” Benji some of those expensive cameras, will Teddie take him as his apprentice? Lovely pictures and AWESOME “cameras”! LOL!! That’s so cute!!! But wait…who took these gorgeous photos of Teddie???! Great pictures of you’re pup he is so cute. I love your blogging style! It is so creative! Teddy is so cute too. This is a beautiful blog – thanks for liking mine – I’d never have found you otherwise. Ohhh that’s such a great idea!!! I should have knitted “knitted pictures” !! i could have done like a Polaroid thing =p The knitted cameras were not complicated at all! It just took a bit of time seaming and putting together the pieces :) Thank you for commenting!! Thank you!!!! I wish Teddie would stay a baby forever!!! 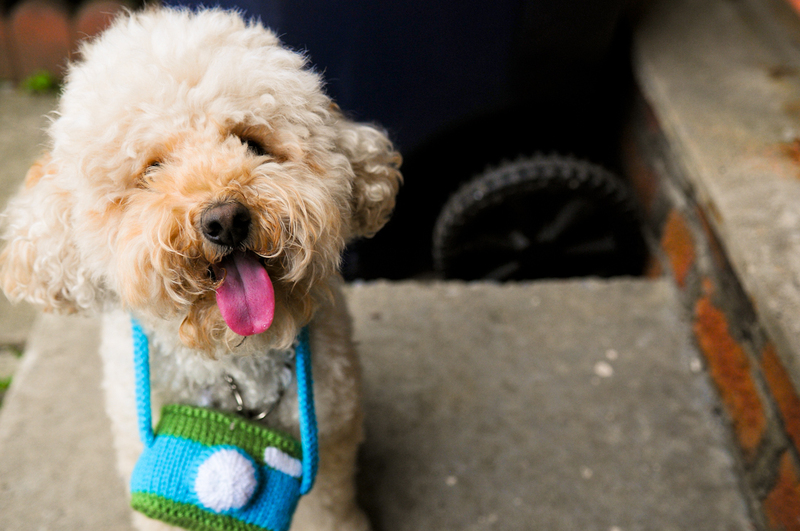 I may be biased, but I love a curly haired dog.. so cute and talented! hahahaha the curls are super cute!!!! Teddie’s special talent is doing tricks lightning fast when a treat is present! Talent and good looks, you must be really proud of Teddie. The cameras are so sweet. Oh yes!! My family LOVESSSs Teddie! When we first got him, he did 2 hip surgeries!! :( So in the first year of his life, he already went through a lot! But he’s a super happy go lucky dog! Aww! Teddie is so cute and those cameras are adorable! Your work is amazing and Teddie is adorable. What a little cutie-pie. :) Those camera covers are gorgeous. These are c-u-t-e! Even the photographer is adorable. Wait! Are those camera covers?! Okay, I’ve never heard of such a thing. The look fantastic anyway. Thanks for stopping by my blog, I appreciate you. Awwww, what a super talented and absolutely adorable pooch Teddie is. Its a good thing my bunnies didn’t see or they’d want camera’s too. I have two, their both friendly with me, but can be a little stand offish or skitty around people they don’t know. :) the bunny you looked after probably would have become more friendly over time :). Cute cute cute!!! I adore Teddy AND the cameras. In all honesty though, how DO you get the pics of your knits to turn out so pretty and vibrant? I genuinely struggle with that..
You’re dog is really cute, and the camera is to die for. You should sell them, because I know at least one person that would purchase something so cute. After my cowl I want to try stitching lace … hmmm I can already feel the pain lol! I am totally, 100% not a fan of dogs…but those pictures are cute as crap. Too cute! I thought the camera was real. LOL Adorable dog. HIIIiiiiiiiiiiiiiiiiiiiiiiiii I’m back!!!! I was going through a career change and it was stressful! but things are now steady again and i’ll be positing more regularly again!!!! Thank you for the award!!!!!!!!!!!!!!!!!!!! Just popping in to let you know that I nominated you and your very talented photographer here for a Sunshine Award. Enjoy! YAY!!!!!!!!!!!!!!!!! Thank you Wendy! i’m checking it out now! Hehehehe I’m glad you like this post of Teddie and his cameras! Thank you for the award!!!!! Does Teddy work on commission? I could use some new pictures for my blog:) What a great post, and the cameras are so cool! This really made me giggle! I want a photographer doggy! awwww thank you and i’m glad this post about Teddie made you giggle!! !